Power quality monitoring has become essential for industries to identify problems in the supply and distribution network and to take preventive actions to avoid any unforeseen system breakdown or wastage of energy. 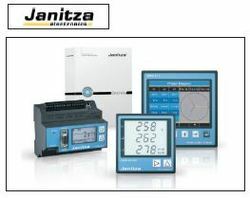 We offer Janitza, Germany, make Power Quality Analyzer. With monitoring of more than 2000 parameters, this technological marvel detects even the minute problems in the distribution network. Further, with utilities on the verge of imposing fines for generating harmonics, this product is all the more important for power consumers. Available in various ranges, all in compact size and easy to install and monitor. Deal in dry type capacitor gas filled capacitors. Thyristor modules, detuned reactors, power quality analyzer janitza, make.